I have dreamt and thought about Lifehack for the last three and a half years. Since joining the team in early 2014, I have done just about all of the roles and tasks under the sun, from organising events to writing reports, listening to communities, designing programmes, facilitating workshops, evaluating initiatives and more. I’ve learnt a bunch of things during my time, not least that I prefer my work to be rewarding, intellectually challenging, and constantly changing. Welcome to the world of social impact-driven complexity. Having come to a time of wrapping up my work in this Lifehack world, I’ve taken some time to distill some of the things that have stood out for me. Getting out of our Wellington bubble was one of the most crucial steps in understanding where some of New Zealand’s young people are at. Travelling to far-flung places and hearing community and social workers describe what’s going on for some of their young people is heartbreaking. Hearing that young people are experiencing a ‘systematic lack of hope’ is shattering. Hearing that young girls on the West Coast choose their boyfriends because they have a car and thus a means to get around, is gut wrenching. As desperate as some of those situations may seem, there is always a glimmer of hope: the amazing people committing to working alongside those young people. The youth workers, social workers, teachers, community organisers who give me faith in humanity, and a sense that there’s good out there in the world. The folks who organise programmes, initiatives and events that give the young people a chance to shine, and grow and where they know that someone’s on their side. Having launched into this work of mental health and wellbeing in New Zealand, I quickly realised not only my lack of context but also the immense privilege that I’d been privy to all of my life. I’ve never gone hungry, always had a warm home, always had positive adult role models around, a mostly free education, and was able to see a doctor at the first necessary moment, to name just a few. Having not experienced the same hardship as some of those people we’ve been working with, I’ve been asking myself how I can use my privilege to draw attention to the injustices of the system and the people suffering within it. Aotearoa is a place of incredible cultural depth. Whilst the last generations have been dominated by a culture of colonisation, there is such richness in the indigenous practices of this place. When I returned to New Zealand in 2014, after having lived here as an exchange student and briefly again as a 19-year-old, I knew only a handful of words. My exposure to te ao Māori up to that point had involved being on a marae once (and awkwardly learning how to hongi as a troupe of teenagers). Early on in my time with Lifehack, I was lucky to spend a few days in Te Tai Tokerau together with Kaye-Maree, who generously introduced me and Anna to some of her relations and contacts as we were scoping where to host a Lifehack Weekend (we ended up going to Kaitaia). Spending that time in Northland not only did I realise the reality of being the only Pākeha person on the streets of Kaikohe, but also how quickly I had to up my game when it comes to the appropriate behaviour in gatherings. Today, I can feel at ease enough when it comes to being welcome onto a marae, singing a few waiata, knowing basic phrases, integrating te ao Māori into our work, understanding protocols, customs and culture—and a few more words, which I try and incorporate into my day-to-day language as much as possible. I’m keen to learn more te reo and am looking into daytime classes I can do once the baby’s here and we’ve gotten to know each other a bit. Whanaungatanga with people from all walks of life—the front-line workers, the community organisers, the policy folks, the entrepreneurs. Most of the time, they un/knowingly cross over into multiple spaces and hearing more about their needs helps piece the puzzle together. 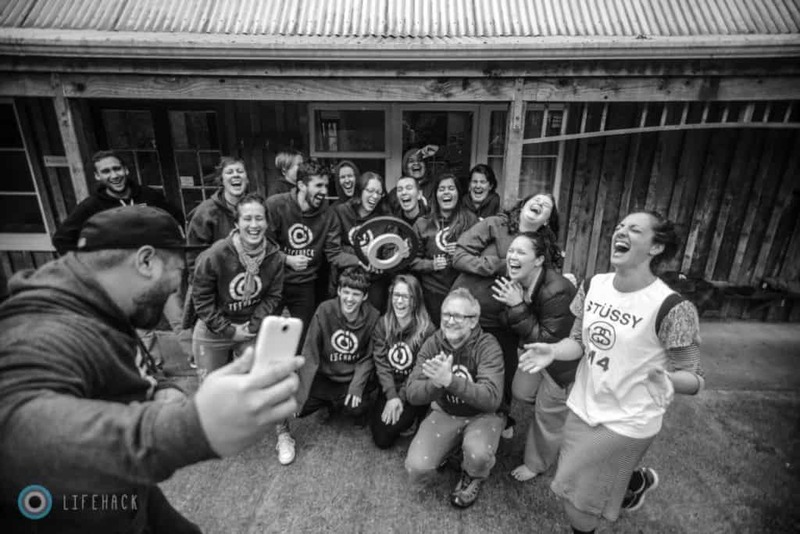 Once you genuinely know where people are coming from (geographically and conceptually) you can start weaving together different threads to encourage collaboration and sow the seeds for a community of folk committed to the same kaupapa. For a variety of reasons, some people are magnets for opportunities. It might be their proven track record, position of power in an organisation or ability to foster relationships well which can mean that some people come across plenty of opportunities—whilst others have a hard time finding just a few. Perhaps because they’re new somewhere, are only starting out with their initiative, or find it harder to put themselves out there. Having ended up in a place where we (the Lifehack team generally, and I specifically, for a while, as one of the main faces and voices of it) we saw opportunities aplenty, it only felt natural to pass on inquires to folks in our community, or find a way to collaborate on those. I remember vividly a time when we working with a group of counsellors. We were introducing the concept of human-centered design when it hit me that many approaches and methods have got posh words and big names in the entrepreneurship world—when they may be common sense in others. Whilst we coach people in the world of entrepreneurship to ‘think about the customer’, that’s all a counsellor really knows: tailoring the sessions they host around the needs of the people they see. It struck me at that time, that sitting at the intersection of different worlds can be a powerful proposition. I have come to acknowledge the power of stories and to see it as one style of data. If I’m sitting in a room of a ministry in Wellington, a story can be a good way of grounding participants in the reality of what life is like for people outside the bubble of privilege. Equally, it can be a powerful way to kick off a hui, or bring a certain point across as in a session. But, depending on the audience, different folks prefer different strokes. For different audience, quantitative data might be more appropriate—and it’s good to find ways to capture outcomes in multiple ways so whatever the situation, there’s a way to tell our stories in the most appropriate and convincing ways. We’ve worked hard over the years to have cohorts for our programmes that are diverse. Even within a sector or a community there’s diversity, even if everyone is thinking about or working on the same topic. Thinking about youth wellbeing, diversity of those who work with young people looks like having peer workers, teachers, nurses, policy analysts, service managers, people running grassroots initiatives, community champions, social workers, project managers and more, from a variety of ethnic backgrounds, ages and genders. One of the most useful little interventions was having a nomination process for our programmes, so that those who don’t see themselves as leaders or being ‘good enough’ still make their way into the application process. This can particularly suit people from cultures in which humility features more heavily. Thinking back across the years, I think we’ve hardly ever run a process that’s completely ‘native’ to Lifehack. The only thing that comes to mind is the work that comes from being at the intersection of design, wellbeing science, entrepreneurship and technology. Most of our sessions, protocols, rituals and ways of gathering have been shamelessly, yet with credit, borrowed and copied. We’ve been paying attention to acknowledge the whakapapa of the work and reference it where possible, whether that’s ice breakers, workshops, whanaungatanga exercises, academic papers or programme inspiration from across the world. We also commited to open-sourcing what we’re learning off the back of using all of the above, in blogs, workshops, and reports. One of the most profoundly common-sensical realisations I’ve had is that we continuously must be prepared to be surprised. Surprised by how people react, by what comes out of programmes, what happens that we didn’t design for. Often, it can be those moments that lead to valuable insights for future initiatives and work. Building in reflection (and evaluation) time after having a run a programme or event is just as important as the event itself. Whether this is a personal or team reflection, questionnaire to participants, observation or all of those—it helps keep us on the track that’s forming ahead of us. Even when we don’t quite know where it leads. Nothing beats a great team. Safe to say, I have learnt endless things about teams, both my own and those we’ve worked alongside. I’ve realised how hard it can be to bring across the appropriate level of context, translate cross-culturally, create the right balance between form and freedom—and create structures and processes that allow people to do their best work. I can’t stress enough the importance of self-care. Whether it’s working out when to step back, seek help, get support, or keep going—it’s such a deeply personal approach for each of us that there’s no one size fits all. Although of course, there are things we know are good for us. People have been complimenting me on the ability to reach out for support—but it’s been through hard work, knowing the evidence, suffering and being supportive of others that has enabled me to do that seemingly so easily. I’m sure there’ll be more as I spend time away from the mahi. You can find me on Twitter or email me here.